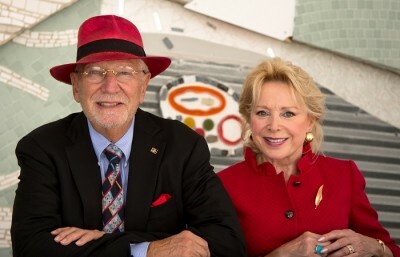 South Florida optometric physician and philanthropist Dr. Herbert Wertheim, a Horatio Alger Medal recipient, has become one of the most important supporters and financial contributors to Florida’s public universities. In doing so he hopes to spur closer collaboration between these institutions, magnifying the societal benefit to Florida and the nation. UF announced Oct. 1 that it was naming its College of Engineering in honor of Dr. Wertheim’s extraordinary accomplishments and his family’s financial commitment of $50 million to the engineering college, launching a $300 million public and private investment in engineering education and research. Dr. Wertheim’s name also graces the medical school at FIU, the Herbert Wertheim College of Medicine. In addition, the Nicole Wertheim College of Nursing and Health Sciences at FIU is named in honor of his wife, Nicole Wertheim. FIU also has the Herbert and Nicole Wertheim Performing Arts Center and the Wertheim Conservatory. In total, Dr. Wertheim and the Dr. Herbert and Nicole Wertheim Family Foundation have contributed more than $100 million to public higher education in Florida. FIU and UF engineering faculty and researchers have a history of working together on large research projects that have an impact on Florida. For example, in September, the National Science Foundation announced grants totaling more than $8 million to both institutions to research ways to make homes and businesses more resistant to hurricane winds. The grants came with the designation of “Experimental Facility” at each university, which makes Florida the go-to place to research, develop and test wind-resistant technologies. Similarly, other groups of scientists at FIU and UF are collaborating on projects in fields that range from agriculture, energy and sea level rise to biomedicine. Some of the schools’ biomedical collaborations involve neural interfaces of ventilatory control, computational modeling of brain stimulation, and stimulation of visceral organs. This type of collaboration is precisely the kind that captures the imagination of Dr. Wertheim, an inventor and entrepreneur who made his fortune developing therapeutic optical technology for lenses that protect the eye from damaging sun rays and other neurologic abnormalities. Cammy Abernathy, dean of the UF’s Herbert Wertheim College of Engineering, said the collaboration opportunities with FIU will benefit not only both schools, but people across the state and the nation, and around the world.